LAS VEGAS, Sept. 13, 2018 /PRNewswire/ -- AML BitCoin (ABTC) continues its banner inaugural year by being listed on one of the world's largest digital currency exchanges, HitBTC. ABTC is the future cryptocurrency with anti-money laundering and 'know-your-customer' (AML/KYC) technology built into the code of the coin. AML BitCoin Token (ABTC) now listed on one of the largest digital currency exchanges, HitBTC! Marcus Andrade, Chief Executive Officer of NAC Foundation and Creator of AML BitCoin, announced the HitBTC listing with great enthusiasm: "Today is a banner day for our innovative project, and a continuation of our efforts to introduce what most consider to be the solution to the cryptocurrency conundrum: a secure digital currency based on AML/KYC technology. The tectonic shift by the world's governments in the past year show the urgent need for a digital currency that can both attract the crypto community and be used in commercial and governmental transactions. We are that coin!" A leader in the digital currency arena, HitBTC is the global innovative trading platform with multi-currency support, high liquidity and low fees, operating since 2013. Provided with rapid powerful API and outstanding matching core engine, HitBTC traders are able to significantly enhance their trading experience. "The reception for our digital currency has been far beyond our expectation and planning," revealed Andrade. "We were hoping that HitBTC would be the first of the larger exchanges to list ABTC, and are thrilled that this has come together. "Our international team has been working for months with governments and industry worldwide to help introduce the AML Bitcoin into their payment systems. We expect to have a major announcement soon." David Mata, Managing Director of Silicon Valley Hedge and Venture Capital Fund Block Bits Capital typifies the excitement building in the investment community: "We took a large early position in AML BitCoin because we had faith in the company and Marcus and without a doubt we see Marcus and his team doing something few other blockchain companies are doing, executing well, and building a sound business strategy. This industry doesn't yet have a blockchain Page/Brin, or Bezos, but Marcus Andrade, with his AML Bitcoin is positioned to be precisely that in this industry." NAC Foundation, headquartered in the U.S., is the creator of the AML BitCoin (ABTC), the future digital currency with anti-money laundering, know-your-customer, anti-terrorism and theft-resistant properties. 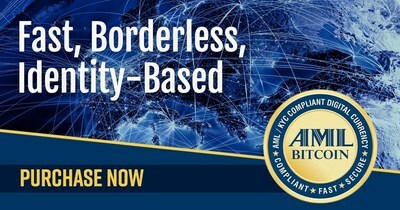 AML BitCoin is compliant with all major national security and financial protection laws and regulations, including the USA PATRIOT Act and the Bank Secrecy Act. NAC's mission is to strengthen the acceptance and use of digital currencies by advancing security compliance throughout the world, combined with blockchain technology. AML Bitcoin is the source of this content. Virtual currency is not legal tender, is not backed by the government, and accounts and value balances are not subject to consumer protections. This press release is for informational purposes only. The information does not constitute investment advice or an offer to invest.